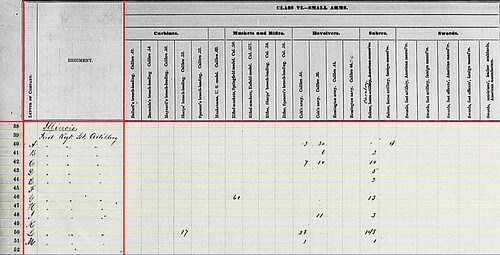 Always a bit perplexing the disregard for alphabetical order among the clerks at the Ordnance Department in 1863. But it is what you make of it. Instead of California following Alabama and Arkansas, it was Connecticut. And next Colorado. I detailed the story of the Colorado Battery, also known as McLain’s Independent Battery, in the last quarter. Recall the battery was “un mustered” by order of the War Department in September 1863. This was justified as the battery had not been organized with official War Department authority. They had cannons. And they were using them. But they were not supposed to be a battery. However, by December, the state was given authority to raise a battery. The governor directed such shortly thereafter. Though, Captain William D. McLain’s appointment was not official until January the following year. A convoluted story that perhaps a historian with more background on the American West can better detail. What I am allowed to focus upon, however, are two summary statement lines, indicating a battery not officially in existence was indeed in service… and serving by sections! 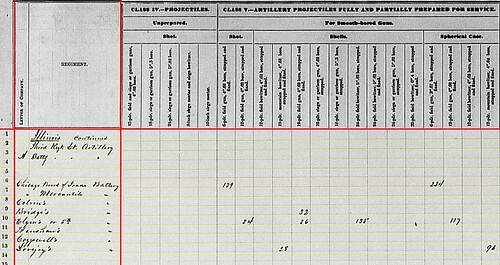 1st [Colorado] Light Battery: At Camp Weld, Colorado Territory, with four 12-pdr mountain howitzers. The return is posted February 5, 1864. Section, [1st Colorado] Light Battery: At Denver, Colorado Territory, according to a March 23, 1864 return. No cannon indicated. At the start of the quarter, other ranking officers of the battery were Lieutenants George S. Esyre and Horace W. Baldwin. Of course, when the “de mustering” took place, all were left without rank. Esyre was discharged at Camp Weld on October 20. His commission restored in February, he was assigned recruiting duty in Denver. Baldwin had a more “exciting” service interruption which I will touch upon in the closing. 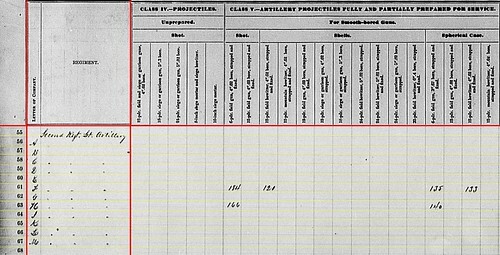 A December department return indicates 1st Sergeant William B. Moore (erroneously identified as a Lieutenant) was in command of a section then at Fort Garland. 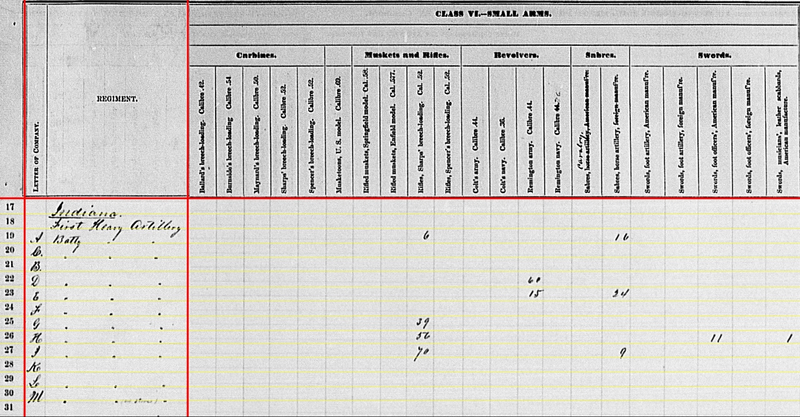 But the main battery listing, in the department returns for December, has the headquarters at Camp Weld under a Lieutenant Chaney M. Crossitt. 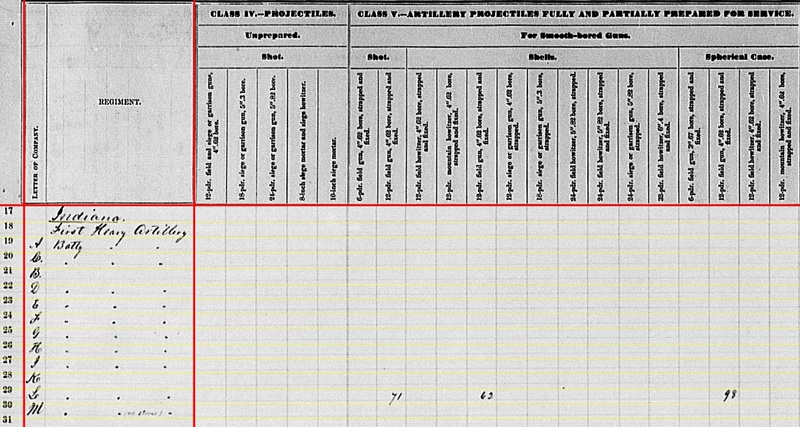 Crossitt was actually the Commissary Sergeant of the 1st Colorado Cavalry. Briefly, from October through December, returns have him detailed in “command” of the Colorado Battery. 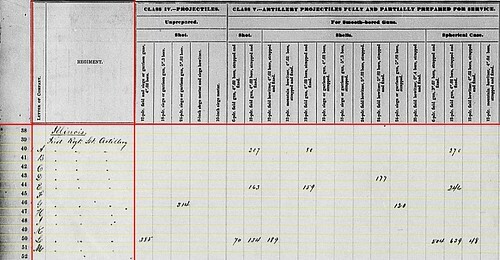 I would think as a practical matter, with a handful of cannon at the post it made sense to assign them to someone (and grant that someone commensurate rank with the responsibility) until this matter with the War Department was settled. So Crossitt had some cannon, even though there was no battery, administratively, at the end of December. 1st Colorado Battery: 90 canister for 12-pdr mountain howitzers. 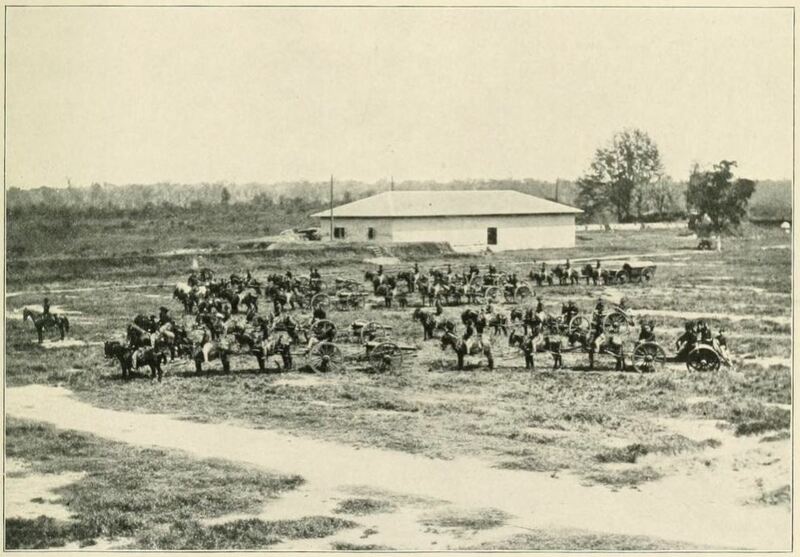 1st Colorado Battery: 38 Sharps carbines, 9 Colt navy revolvers, and 76 cavalry sabers. Section at Denver: 15 Springfield muskets and 8 cavalry sabers. I left Fort Garland at 11 o’clock a.m. on the 12th day of October, 1863, and proceeded up the road toward the Sangre de Cristo Pass, to a spot in the road where a man, supposed to be Espanoza, had committed certain outrages a day or two previous. Camped near this Spot the first night. Next morning we discovered the trail of the party or parties who were supposed to have committed such outrages as were known to have been committed, from the fact that two mules had been shot and one carriage burned, the remains of which were then lying in the first-mentioned spot in the road, about 18 miles from Fort Garland, Colo., on the Sangre de Cristo Creek. We followed this trail until it led us into the main traveled road, when and where we were obliged to leave it. Going again to the ruins in the road, we took a new direction, directly opposite to the one we had taken the day before. We followed along the mountains on the north side of the road until we struck the range of the Sierra Madre Mountains. Finding no signs of importance, we followed along this range in a southern direction, entering the Great Cañon at its mouth, near the main road. Here we discovered a moccasin track, which we followed a number of miles, but left it, as signs indicated that it was old and of no importance to us. Upon leaving this cañon, about 5 miles from its mouth, the trail of two men (or man and boy) was found. From signs it was evident that these persons had either led or driven two cattle along that spot not to exceed two days before. Following this trail through an almost impassable fall of dead timber a distance of about 5 miles, a number of crows were seen flying over a spot on the side of, and near the top of, a lofty mountain, indicating a camp or carrion near; two magpies were also seen flying about near this spot. Being convinced that a camp was near, I sent a few men with the horses which were being led (several men being dismounted and in advance) to the rear and behind a hill, that they might not be seen, or their heavy tramp over dead timber might not be heard, in case the object of our search should be near at hand. Thomas Tobin (guide) and 4 soldiers were in advance. The horses were scarcely out of sight, behind the hill, when a shot was fired from Tobin’s rifle, he having approached the camp and discovered a man (Mexican) sitting on a log at the spot indicated by crows, &c., and fired, wounding the man. A boy was at this time seen to run from a spot near where the man was sitting. He was instantly shot. The man, Espanoza, had dodged behind a log or logs, which had been thrown up as a sort of defense. While lying in this position behind the logs he was fired at several times by advancing party (soldiers). From this sort of defense Espanoza fired two shots at soldiers, but without effect. He then raised his body enough to be visible, when he was pierced by many balls, killing him instantly. The heads of the two dead persons were severed from the bodies and taken to our first night’s camp, on Sangre de Cristo Creek, about 18 miles from Fort Garland. Started before daylight from this camp on morning of the 16th of October, 1863, for Fort Garland, arriving at the latter place at 9 a.m. same date. We delivered to you the heads of the two persons as soon as we arrived. 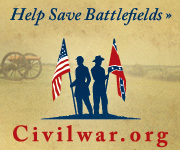 Duty more befitting a US Marshal than an artillerist! The desperado was betrayed by the magpies! Baldwin returned to duty with the newly re-formed battery. And he would serve with it for the rest of the war, with breaks in service for recruiting duty. As for the head of Espinosa? Rumor is the head was put in a jar of alcohol and displayed at different businesses around Denver. Sometime in the 20th century when a reporter sought to track it down, everyone seemed to have seen the head but nobody could cite the whereabouts. Lost to history? Or is that macabre artifact sitting in a Denver attic waiting rediscovery?